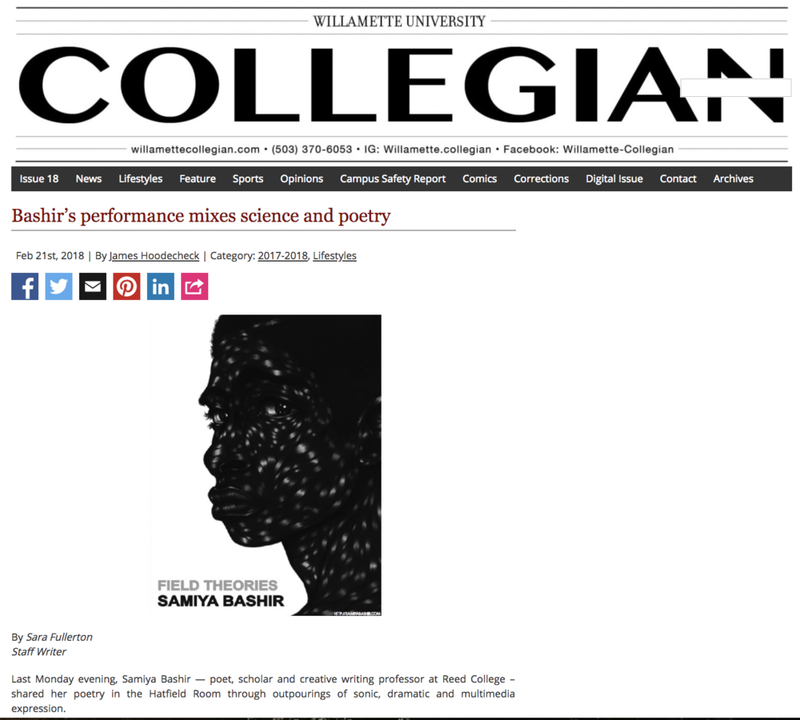 Poems that describe "with scientific precision the position of the black body in American culture"
& grab your own signed copy at get you some! Thanks to Marcella Durand @ Hyperallergic for sharing love out in the field. Check out their new review of FIELD THEORIES below, and click through to read the whole thing. On my coast, we've only got 15 days until the full solar eclipse! So let's celebrate with a slow dip through "Coronagraphy" -- I'll be sharing one poem per day from the 15-poem sonnet cycle until the corona shines! Stuck: something here about black folks—all of us no matter our gender, our shade, our size—finding ourselves together-and-apart in a cycle of oppression that fits us all a bit differently. Throughout these poems, John Henry and Polly Ann find themselves in quicksand of like origin. Their experience is unique to each of them, but both are being pulled under. Thank you to my alma mater, The University of Michigan! Check out the rest of they're Summer Reading Lineup! 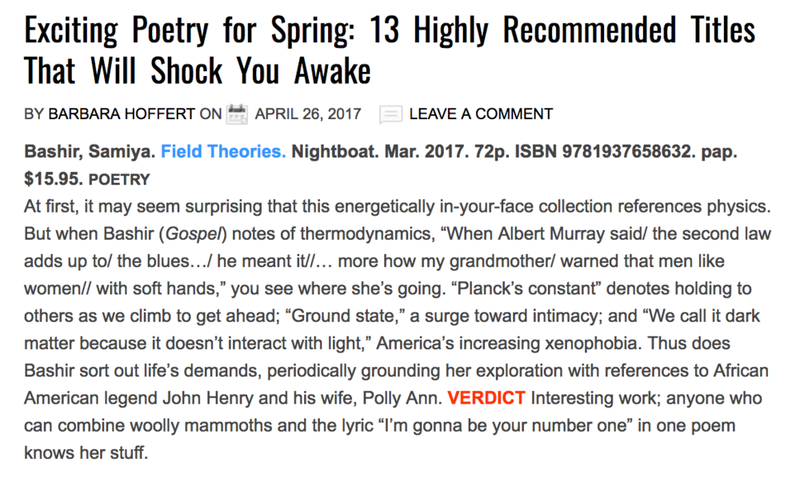 Library Journal ❤️s Field Theories! "...anyone who can combine woolly mammoths and the lyric “I’m gonna be your number one” in one poem knows her stuff." As Portland digs itself slowly out of the long long winter season, I'm pulling my kiddoes out of the classroom and into the streets. The weeks of field trips have begun! Today we had sun! We had blossoms blooming on trees! We had flowers sprouting from buried bulbs! We all piled into my car and flipped ekphrasis on its head! We've spent a little time this past month also interrogating artists and art practices that intersect with poetry. The divine Alison Saar came to our class and we talked about our own collaborative projects, as well as projects she's done with Evie Shockley and Erica Hunt. I was thrilled to introduce my students to ARCADE. It's such a beautiful book. I'm sad it's out of print. Call and clamor to Kelsey Street Press to print more! 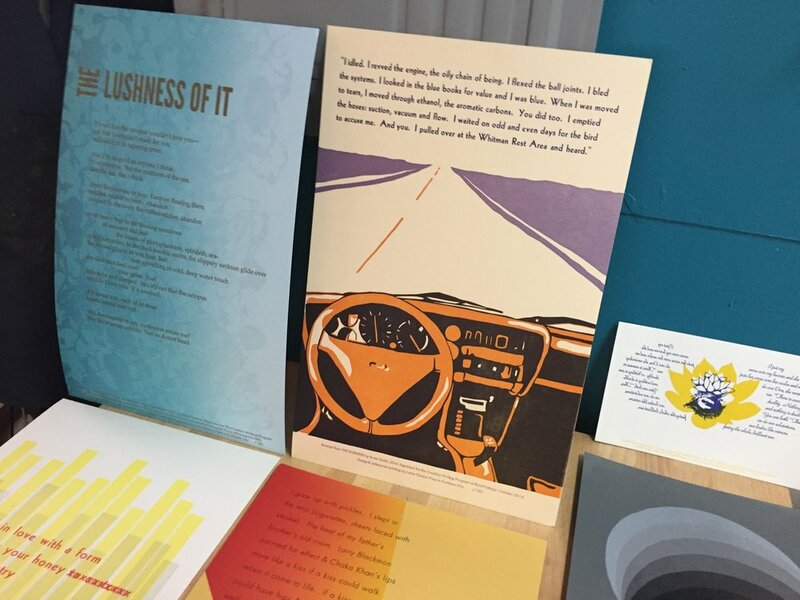 And today, we headed up into NE Portland to visit Letra Chueca Press, run by the indomitable Daniela Ragan (my collaborator for our beautiful Poetry Salon broadsides). What a great field trip our Artist/2/Artist: Experiments in Ekphrasis class had visiting Letra Chueca! We talked poetry, art making, gift economy, printing, ekphrasis, and even printed a little take-away. Thanks to great students, great sunshine, great artists and collaborators: it's time to open ourselves up to all that is new. Go outside and learn something!